Hello! Looking at this for a venue for my wedding. Has anyone had their reception here? Thoughts? Also looking for an idea of the total price once you include stuff that dont provide. Any other suggestions for reasonable priced venues in the lehigh valley? We looked into it. We loved the venue, but we didn't like that the pricing wasn't all inclusive (by this I mean, the hors d'oeuvres, entrees, bar, etc were all priced separately). It ended up being a little more than we planned on spending. We ended up going with Hanover Grande Ballroom (there is one price for d'oeuvres, entrees, bar, cake, etc). 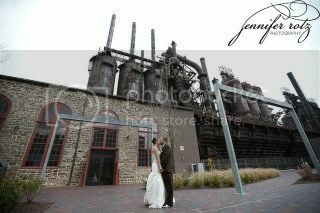 We're planning on doing our photos on the grounds of the Steel Stacks. We looked into doing our wedding ceremony there. It was awful. No one would get back to us. We had to call and email for months to get our questions answered. We finally decided to just go with a church. Beautiful place but very disorganized inattentive staff. I know this response is probably late, but just in case anyone else is looking at Steel Stacks ---- we are in the process of booking our wedding there. They offer two different rooms (Blast Furnance and Musikfest Cafe). Both have a minimum spend, and for a Saturday evening. All of the menus and prices are posted online, and you can customize your event, which is what my fiance and I were looking for (we didn't want a cookie cutter wedding reception). We found the catering staff to be very responsive and easy to work with.